The 3rd Tuesday in September is a peculiar day for ICT stakeholders in the Netherlands. Since there is no such thing as a department of Digital Affairs the question always is whether ICT or related concepts will be mentioned in the king’s speech. After all ICT is widely regarded as the enabler of digital transformation and accelerator of economic growth. But does it get the official credit for it? In the table below we made a Word-count for ICT and related concepts for the last 9 years in the king’s speech. These key ambitions translate further into 24 sub-ambitions. It is in fact the first-ever holistic view of Dutch government with respect to the role of digital technologies. Kudos for that. Digital Belgium supports an approach, which boosts the digital economy and expands the prospect of jobs and growth. Digital Belgium wishes to continue to advance the pioneer role that Belgium plays in rolling out new technologies for ultra-fast internet. Digital Belgium is continuing the efforts to implement a digital transformation of the federal government, aiming at digital-by-default end-to-end interactions with citizens and organizations. Digital Belgium wants to ensure digital confidence and digital security by respecting rights and strategically and effectively tackling illegal practices. It may not come as a surprise, but the Dutch digital ambitions look a bit, well, a lot, like those of our surrounding countries. Nevertheless, all these ambitions make sense. Cyber security, digital skills, open data, first class digital infra, digital government services, etc., are key issues in a country’s digital transformation process. 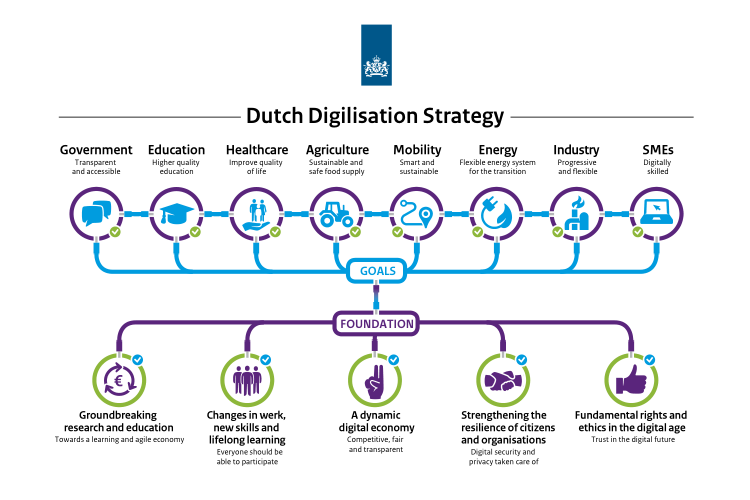 But what is disappointing is that while digital technologies are the acknowledged driver of our future society and economy, the Dutch digital agenda doesn’t go much further than stating its ambitions and intentions and plans. The government budget 2019 doesn’t show any financial implication with respect to carrying out the Dutch digital agenda. The infrastructure fund (€ 6.4 billion in 2019) is 100% aimed at improving water, rail and road connectivity, capacity and management; the digital infrastructure is not even mentioned. The ministry of Education is the third largest department with a budget of € 38 billion. It’s main digital priorities are with a new supercomputer and support for the digital library. There are no clear plans for substantial investments in our crucial ICT-knowledge infrastructure. It is true that in the annual budget some € 30 million is set aside for cyber security; more than last year. It doesn’t sound like an awful lot and is not clear where that money is going to but the FUD-factor (using fear, uncertainty and doubt as the all important motivation) has at least paid off. It is time that the government’s digital ambitions are substantiated with more than just time, effort, promises and vague objectives and put their money where their digital mouth is. As € 182 billion of our GDP (29%) is currently generated by our digital workforce, this doesn’t seem very unreasonable.